Xylosyltransferases (XylTs) play key roles in the biosynthesis of many different polysaccharides. These enzymes transfer d-xylose from UDP-xylose to substrate acceptors. 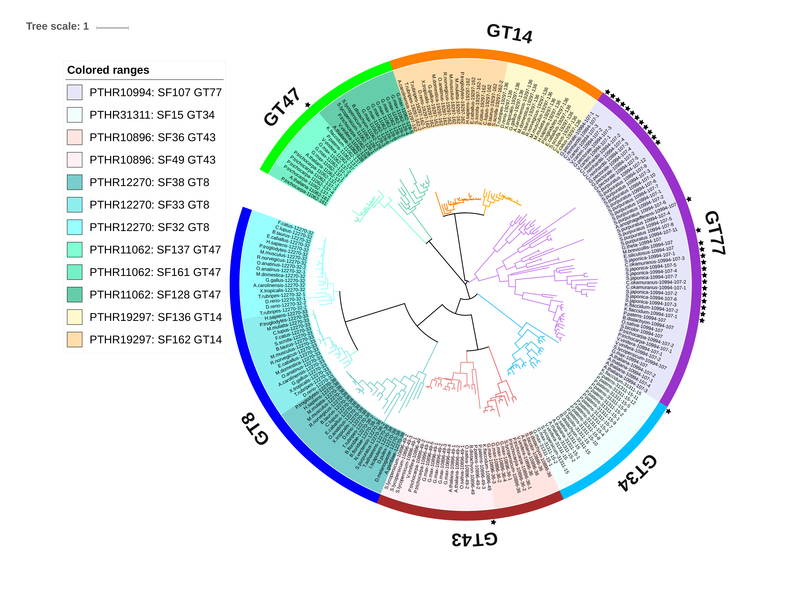 In this study, we identified 30 XylTs from primary endosymbionts (green algae, red algae, and glaucophytes) and secondary or higher endosymbionts (brown algae, diatoms, Eustigmatophyceae, Pelagophyceae, and Cryptophyta). We performed comparative phylogenetic studies on key XylT subfamilies, and investigated the functional divergence of genes using RNA-Seq. 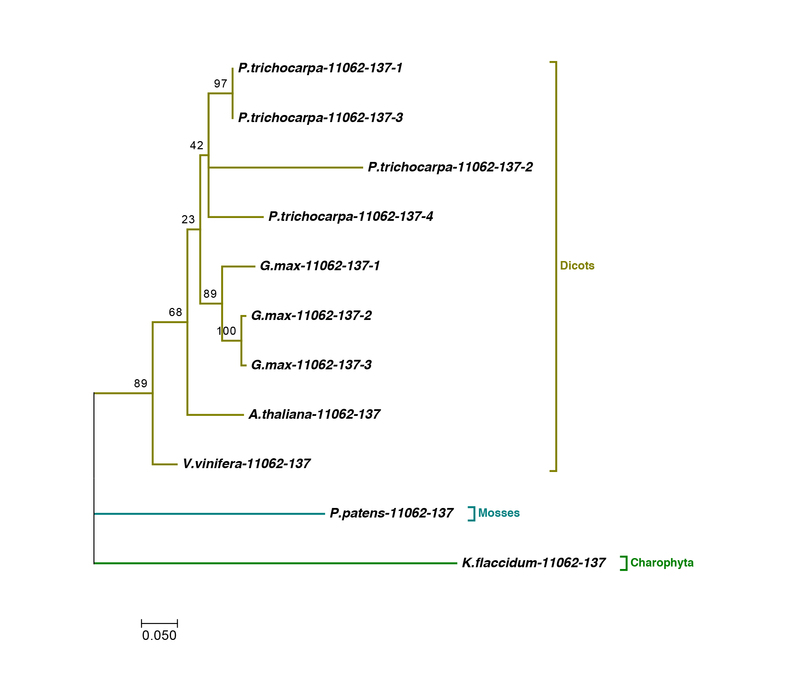 Of the 30 XylTs, one β-1,4-XylT IRX14-related, one β-1,4 XylT IRX10L-related, and one xyloglucan 6-XylT 1-related gene were identified in the Charophyta, showing strong similarities to their land plant descendants. 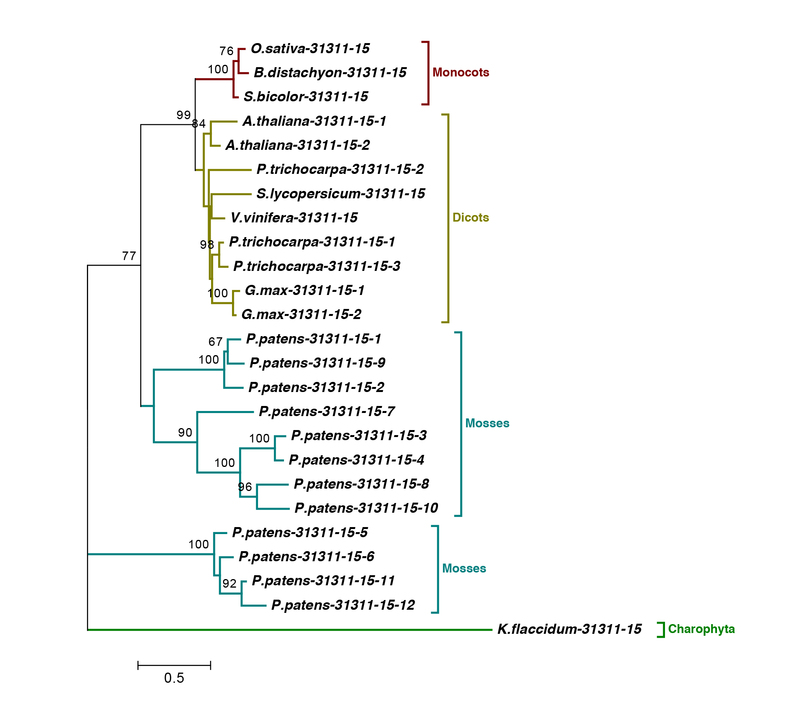 This implied the ancient occurrence of xylan and xyloglucan biosynthetic machineries in Charophyta. The other 27 XylTs were identified as UDP-d-xylose: l-fucose-α-1,3-d-XylT (FucXylT) type that specifically transferred d-xylose to fucose. 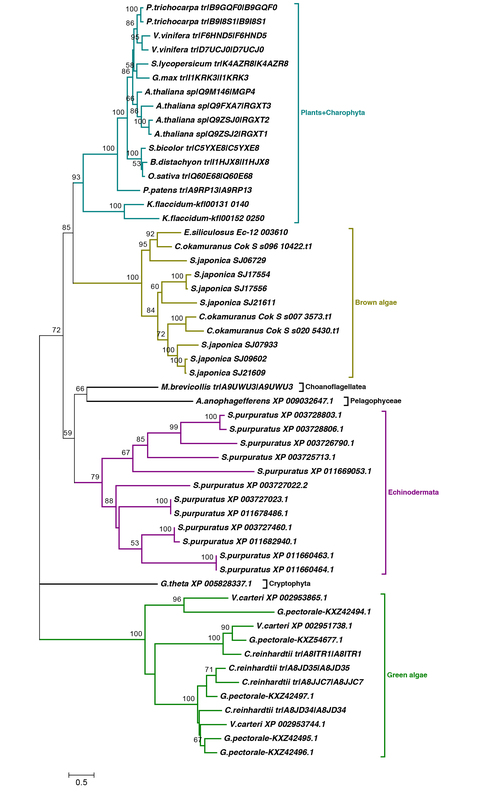 We propose that FucXylTs originated from the last eukaryotic common ancestor, rather than being plant specific, because they are also distributed in Choanoflagellatea and Echinodermata. 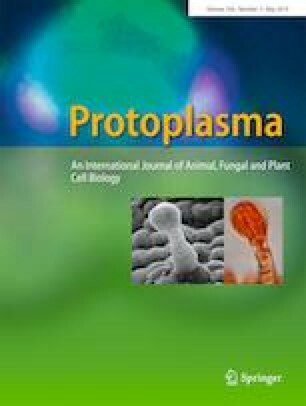 Considering the evidence from many aspects, we hypothesize that the FucXylTs likely participated in fucoidan biosynthesis in brown algae. 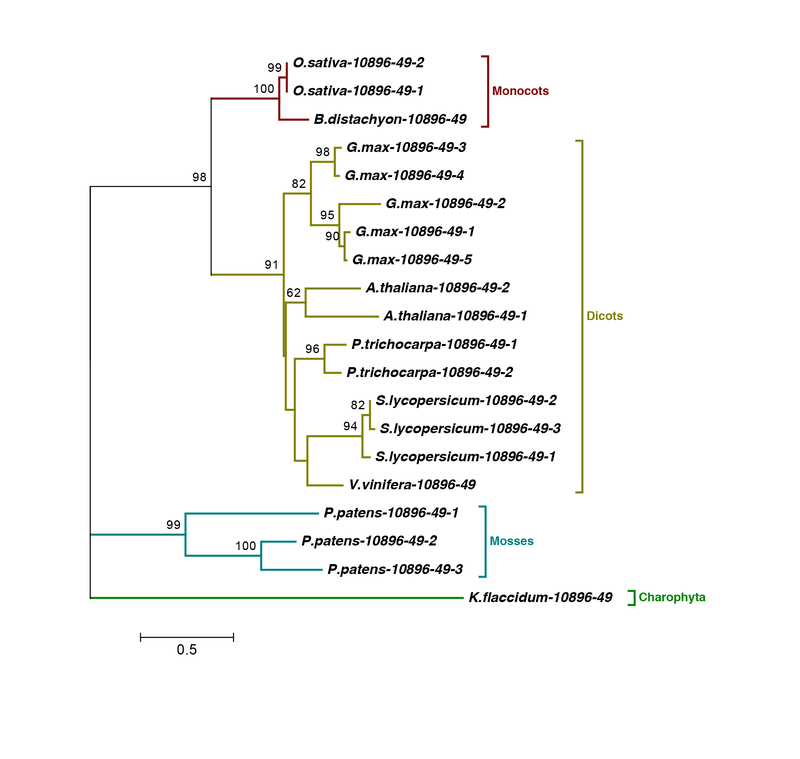 We provide the first insights into the evolutionary history and functional divergence of FucXylT in algal biology. The online version of this article ( https://doi.org/10.1007/s00709-019-01358-2) contains supplementary material, which is available to authorized users. N.Y. planned and designed the research. W.H., X.F., and L. T analyzed and interpreted the data for the work. W.H wrote the manuscript. M. J. S. K., X.D., X.Z., and Y. Y. revised it critically for important intellectual content. This work was supported by the national key research and development program of China (2018YFD0900703, 2016YFC1402102, 2018YFD0901503-8), Marine S&T Fund of Shandong Province for Pilot National Laboratory for Marine Science and Technology (Qingdao) (NO. 2018SDKJ0406-3); Financial Fund of the Ministry of Agriculture and Rural Affairs, P. R. of China (NFZX2018). Projects of International Exchange and Cooperation in Agriculture, Ministry of Agriculture and Rural Affairs of China-Science, Technology and Innovation Cooperation in Aquaculture with Tropical Countries along the Belt and Road; Shandong key Research and Development Plan (2018GHY115010); National Natural Science Foundation of China (41676145); China Agriculture Research System (CARS-50); Central Public-interest Scientific Institution Basal Research Fund, YSFRI, CAFS (20603022016001, 20603022019006); Taishan Scholars Funding of Shandong Province; Talent Projects of Distinguished Scientific Scholars in Agriculture.